La bande à Picsou (2017) (2017) : Série TV de 2 saisons et 57 épisodes diffusée sur Disney XD. Casting, acteurs, bandes annonces et actualités. Casting de la série "La bande à Picsou (2017)"
S01E01 La Bande à Picsou et l'Atlantide ! 12/08/2017 Donald Duck n'a pas le choix : pour se rendre à son entretien d'embauche, il doit laisser ses trois neveux Riri, Fifi et Loulou à son oncle Balthazar Picsou, avec qui il est en froid depuis 10 ans. Déçu de rencontrer un milliardaire aigri, les triplés vont découvrir avec Zaza, la petite-fille de la gouvernante de Picsou, que les histoires des aventures du canard sont vraies et que leur oncle Donald y a pris part. S01E03 À la recherche de la pièce fétiche 23/09/2017 En voyant que Loulou profite des largesses permises par sa fortune, Picsou l'emmène à son bureau afin de lui enseigner la valeur du travail. Fifi et Zaza profitent du trajet pour se rendre dans les archives du milliardaire, espérant y découvrir le secret de la disparition de Della Duck, la mère de Riri, Fifi et Loulou. S01E04 Un anniversaire chez les Rapetou 30/09/2017 Alors que Zaza se retrouve seule pendant une sortie en bateau de Riri, Fifi et Loulou, elle rencontre Lena et la suit dans une virée qui va l’amener à recroiser la grande famille Rapetou. S01E06 La Malédiction du jeu 14/10/2017 Donald doit affronter son cousin Gontran dans un mystérieux hôtel de Macao. Picsou a le plus grand mal à détourner ses neveux des nombreuses distractions présentes dans cet hôtel-casino..
S01E13 Enquête au manoir Picsou 25/05/2018 Huey decides to throw a birthday party for Scrooge, despite everyone warning him that Scrooge hates celebrating his birthday. When Scrooge goes missing and the guests turn out to be his worst enemies, Huey decides to solve the mystery, unaware that the ghost of Scrooge's faithful butler, the long deceased Duckworth, is involved. S01E14 Les dents du coffre fort 16/06/2018 The kids and Launchpad work together to capture a mystical money shark while Scrooge attempts to better his public image with a televised interview. S01E15 The Golden Lagoon of White Agony Plains! 23/06/2018 Scrooge re-teams with his conniving ex-partner and old flame, Goldie O' Gilt, to find a long-lost golden lagoon, but Glomgold has other plans. S01E16 Day of the Only Child! 30/06/2018 When Dewey invents a holiday that allows the triplets to be only children for a day, each realizes they need their brothers more than they thought. S01E17 Les dossiers confidentiels de l'agent 22 07/07/2018 Webby learns how Scrooge and Mrs. Beakley first met while she helps Scrooge rescue her granny from the clutches of rival spy Black Heron. S01E18 Who is Gizmoduck?! 14/07/2018 As Fenton figures out how to be a hero, Mark Beaks offers to hire Gizmoduck and help him defend all of Duckburg. S01E19 The Other Bin of Scrooge McDuck! 21/07/2018 Lena's loyalties are tested when Magica forces her to lead Webby on a raid to a facility full of Scrooge's most dangerous artifacts to find his No. 1 Dime. S01E20 Sky Pirates…In the Sky! 28/07/2018 Feeling ignored, Dewey finds a new family: a band of singing and dancing pirates looking to rob Scrooge blind. S01E21 The Secret(s) of Castle McDuck! 04/08/2018 On a family trip to Scrooge's ancestral castle, Dewey tries to hide the truth about his mother as his brothers search for family secrets. S01E22 The Last Crash of the Sunchaser! 11/08/2018 Stuck on a precarious peak, the kids secretly search the plane for clues about Della's disappearance. S01E23 The Shadow War! 18/08/2018 Magica De Spell is close to exacting revenge on Scrooge, so the family races against time to plan a dangerous rescue mission to save Scrooge and the city. S02E01 Soirée jeu ! 20/10/2018 A game night is anything but relaxing as the family faces shrink rays, a barbaric civilization and an unhealthy level of competitiveness. S02E02 Plongée en eaux troubles avec Popop ! 27/10/2018 Huey and Dewey are led on an adventure by their distant Uncle Fethry, who takes them to the depths of Scrooge's deep-sea laboratory. S02E03 La ballade de Duke Baleineau 03/11/2018 After his disappearance, Glomgold resurfaces as anything but his ever-scheming self, while Webby and Louie try to uncover the truth behind who is Duke Baloney. S02E04 The Town Where Everyone Was Nice! 10/11/2018 The family visits a Brazilian town with a dark secret where Donald reunites with his old friends Jose Carioca & Panchito Pistoles (Bernardo de Paula & Arturo Del Puerto), thus reuniting The Three Caballeros. S02E05 Storkules in Duckburg! 17/11/2018 Louie recruits Storkules for his professional monster extermination business, while Storkules faces his greatest challenge: being Donald's roommate. S02E06 Last Christmas! 01/12/2018 Scrooge avoids the pressures of the holidays by traveling back in time with a trio of fun-loving ghosts to crash history's greatest Christmas parties; time-lost Dewey teams up with young Donald Duck to find his mother on Christmas. S02E07 What Ever Happened to Della Duck?! 09/03/2019 Della struggles for survival against dangerous elements of the Moon, as she looks for a way to get back to her family on Earth. S02E08 Treasure of the Found Lamp! 07/05/2019 As the boys track a missing artifact across Duckburg, Scrooge and Webby stall the warrior looking for it with a phony quest. S02E09 The 87 Cent Solution! 09/05/2019 The kids must stop Scrooge's unhealthy obsession with a few missing coins to keep him from becoming the next Glomgold. S02E10 The Golden Spear! 10/05/2019 As Della rebuilds her ship, Penumbra becomes convinced Della’s planning an attack. Meanwhile, Donald’s nap keeps getting interrupted by adventure. S02E11 Nothing Can Stop Della Duck! 13/05/2019 Della Duck has faced every danger the moon has to offer to reunite with her family, but her greatest challenge is one she might not be able to fight her way out of. S02E12 Raiders of the Doomsday Vault! 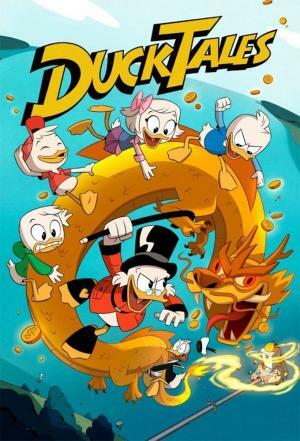 14/05/2019 Dewey tries to prove himself by exploring a frozen fortress in search of a money tree seed, but Glomgold has kidnapped Scrooge in order to find it first. S02E13 Friendship Hates Magic! 15/05/2019 Stuck as a shadow, Lena tries to protect Webby from her suspicious new friend Violet during a supernatural sleepover. S02E14 The Dangerous Chemistry of Gandra Dee! 16/05/2019 With Huey’s and Webby’s help, Fenton woos a punk-rock scientist, Gandra Dee, only to uncover her dangerous plans for Gizmoduck. S00E01 DuckTales: First Look 02/03/2017 A first look at the all-new family comedy-adventure series "DuckTales" premiering this summer on Disney XD. 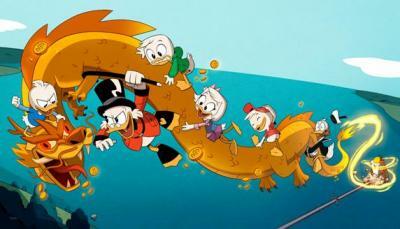 The series stars David Tennant as Scrooge McDuck; Danny Pudi, Ben Schwartz and Bobby Moynihan as the voices of Huey, Dewey and Louie, respectively; Kate Micucci as Webby Vanderquack; Beck Bennett as Launchpad McQuack and Toks Olagundoye as Mrs. Beakley, and will follow the epic family of ducks on their high-flying adventures around the world. S00E02 Donald Duck's Tales 10/03/2017 Donald Duck is the over-stressed guardian to his three nephews, Huey, Dewey, and Louie. They may drive him crazy, but Donald puts his family first – even if that means tagging along on dangerous adventures that tend to get him hurt. S00E03 Donald's Birthday 09/06/2017 Ducktales (2017) short featuring: Donald Duck. Uncle Scrooge, Huey, Dewey, Louie and Webby surprise Donald for his birthday - only for things to go awry. S00E04 Meet Webby Vanderquack! 09/06/2017 Ducktales (2017) short featuring: Webby. Webby proves she is the ultimate treasure hunter when trying to get to the...cookie jar! S00E05 Meet Mrs. Beakley! 09/06/2017 Een gewone dag bij de familie Duck. S00E06 Meet Scrooge! 09/06/2017 Ducktales (2017) short featuring: Scrooge. A time machine in the shape of a clock causes some trouble for Scrooge. S00E07 Meet Huey! 09/06/2017 Ducktales (2017) short featuring: Huey. Huey proves again that The Junior Woodchucks' Guidebook has the solution to everything. S00E08 Meet Launchpad McQuack! 09/06/2017 Ducktales (2017) short featuring: Launchpad. After causing his usual massive destruction, this time landing his plane on a road with cars, Launchpad decides to write notes for the owners of damaged cars. S00E10 DuckTales Cast Sings Original Theme Song 16/12/2016 The all-star voice-over cast of the upcoming DuckTales reboot paid the highest form of respect to the original by singing the classic theme song! S00E11 The World’s Longest Deathtrap (1) 28/05/2018 With Webby and Dewey trapped in a temple, will they escape? Will we find out just how long this death trap goes on for? Envie de parler de La bande à Picsou (2017) ? Les discussions sont là pour vous. Retrouvez toutes les informations sur La bande à Picsou (2017) lancée en 2017 : synopsys, casting complet, acteurs, scénariste, réalisateur. Découvrez des séries similaires à regarder également. Faites vous une idée de la série grâce à la note des membres et aux critiques des internautes.